Gab Dissenter May Rock Web — Gab.com, the free-speech Twitter alternative that we have been following for the last 15 months or so, has taken a big step with the release of Dissenter, a product that will allow uncensored commenting on any website. That means the Washington Post and CNN cannot keep you from pointing out their falsehoods. It means Facebook and Twitter can’t stop you from responding. It even means Wikipedia can’t stop you from correcting their articles. Dissenter is also a great news feed and information source. Dissenter is fully described here. DuckDuckGo 9 Billion searches in 2018 — Paoli-based search engine and privacy defender DuckDuckGo has announced served over 9 Billion private searches in 2018. DDG is in every way we found better than Google and works on all browsers. Gab.com — a social media alternative to Facebook and Twitter — has published the below statement regarding its commitment to free speech and noting that now the fastest growing social media platform in the world. 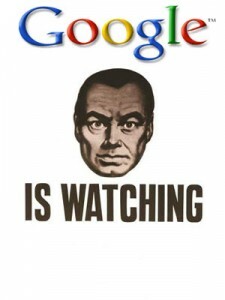 It’s worth posting here considering the revelations of Orwellian group-think coming out of Silicon Valley. We are proud to have recently met our fundraising goal of $1.07m raised directly from The People. We have made considerable progress this month making Gab the home of free speech, free association, and the free market online. This includes an update to our mute system that gives more control to individual users to shape their own experience. Unfortunately we still have not been able to get a new payment processor, although we are accepting checks to our PO Box and will be integrating bitcoin as a payment option shortly. On a daily basis, our company uses the protection afforded by the First Amendment, federal data privacy law, and American global hegemony to provide a utility for users all over the world, wheresoever they might be, to publish their innermost thoughts and engage in open dialogue without fear of recrimination from unfriendly and repressive governments. Put another way, we structure our affairs to afford all our users the full measure of due process rights available in the United States. As a result, Gab is now the fastest-growing social media platform in the world. We have acquired over 800,000 users and new Gabbers are joining the site at a rate of nearly 100,000 a month from across the planet. Gab has over 10.6 million visits a month and is quickly becoming a home for those who wish to think, speak, and express themselves freely. One unintended consequence of our moderation policy is that Gab has attracted, shall we say, a colorful user base. Most if not all of the team, from the CEO down to our external contractors and service providers, can find an enormous amount of content on the site which we each find morally or politically objectionable, even personally hateful. However, we understand that adopting a moderation policy that mirrors the First Amendment will result in users of our site expressing views with which we disagree, including “the thought that we hate.” See Matal v. Tam, 582 U.S. ___ (2017). We do not, unlike virtually every other social media company in existence, think we have any right to try to change what our users think. The mainstream media strongly implies that Gab’s provisioning of a forum for this speech runs the risk of encouraging expression “(escalating) from online speech to real-world action.” We dissent. Hateful speech may be found on every platform with millions of users, including Twitter and Facebook; Gab is not alone in this regard. When one creates a space where controversial speech is permitted, controversial speech should be expected. This is only news for anyone who doesn’t understand what “free speech” actually means. And today, Gab stands as the largest social network in the world that willing to take the heat involved in standing by this oldest and most classically liberal principle of liberal democracy. We follow the American tradition to the letter. We will continue to do so as long as the company exists. Twitter Hypocritical H8 Site — We published a post Nov. 5 celebrating the return to the internet of free-speech defender Gab. 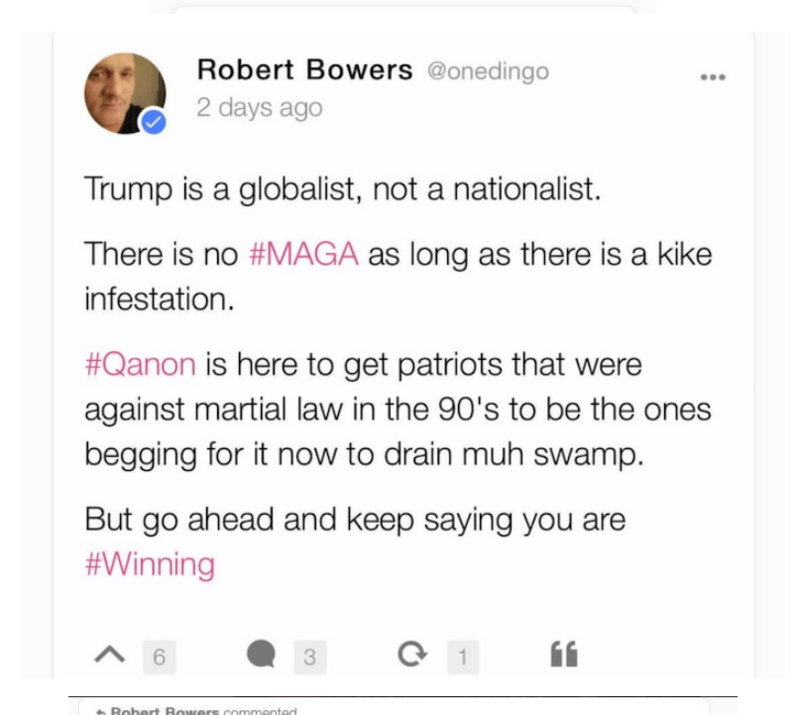 Gab, a Twitter alternative, was kicked off the web by its hosting provider Joyent on Oct. 29 for having allowed Robert Bowers to post. Bowers murdered 11 persons two days before during Shabbat services at the Tree of Life synagogue in Pittsburgh. He also wounded seven others, including four police officers. Anyway outrage ensued; Gab was removed and virtue was signaled. Which brings us to the latest regarding Twitter. Saudi prince and billionaire Alwaleed bin Talal was a major investor in Twitter. In 2015, he owned 34.9 million shares in it which put him ahead of CEO and co-founder Jack Dorsey. Alwaleed was arrested in the Kingdom on Nov. 4, 2017 and held for three months with freedom coming as part of a financial deal with the higher ups in the Saudi family. What was the deal? Did it involve something with Twitter? Did it involve something leading to the Oct. 2 death at the Saudi embassy in Turkey of his friend journalist Jamal Kashoggi? Soon after Kashoggi’s brutal death it was revealed that Saudi Arabia has created a massive Twitter “troll army” to sway public opinion especially in the Mideast. And today (Nov. 7) it was reported that journalist Turki Bin Abdul Aziz Al-Jasser was tortured to death in a Saudi jail for criticizing the ruling family via a secret Twitter account. How did the tyrants learn of the account? Via spies at Twitter’s regional headquarter in Dubai. How many Saudi spies have infiltrated Twitter? How much do they interfere with our elections? Sounds like a dangerous H8 site to us. Perhaps Twitter should be banned from the web. That last sentence was sarcasm but it illustrates the poison of political correctness and the hypocrisy of virtue-signaling double standards. GAB Back Online, Free Speech Wins — GAB has returned. The free speech social networking alternative to Twitter was kicked off the web by hosting provider Joyent on Oct. 29 after it was revealed that Pittsburgh synagogue massacre suspect Robert Bowers was a poster on the site. An example of Bowers’ postings is to the right. The Oct. 27 massacre left 11 dead and seven wounded, including four police officers. Anyway, outrage occurred and GAB got blamed for inspiring the evil. Cynics might say it was just an attempt by Silicon Valley powerbrokers to maintain an hegemony on the flow of information and squelch a potential competitor while it was still in the cradle. It is not as though Twitter never served as a conduit of hate, after all. Or Facebook, for that matter. Anyway GAB is back. It’s easy to block the H8ers –or confront them if that is your wish. We encourage all to join it. 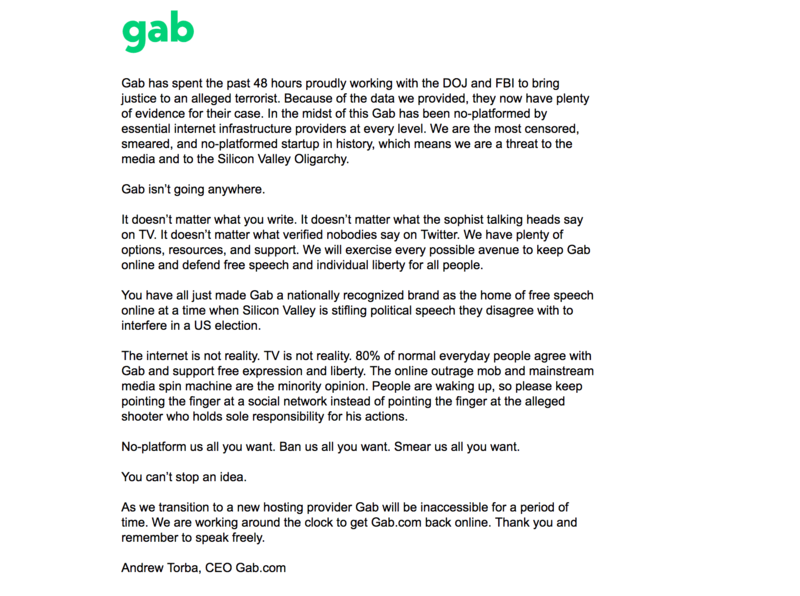 To the right is the statement GAB ran last week while it social networking part was offline. Click to enlarge. It’s the Willis Tower now. Prodigy And Sears’ Ironic Bankruptcy — Sears, once the world’s largest retailer with the world’s tallest building, filed for bankruptcy today, Oct. 15, and is about to disappear. Some are crediting Amazon and it’s use of mail order and the internet. The irony is that Sears became the Goliath of its day through mail order and catalogs, and that Sears through it’s involvement with the the online service Prodigy was an pioneer in the internet and e-commerce. The Pentagon had an ambitious plan to build a database tracking a person’s entire existence. It was called LifeLog. The idea was to gather in a single place just about everything an individual says, sees or does; the phone calls he made, the emails he sent, the movies he watched and the music he liked. Civil libertarians found out about it, however, and raised a fuss. So on Feb. 4, 2004, it was announced that the intrusive project was being cancelled. Entirely coincidentally we are sure, that was the date Facebook was launched. Write In C Let It Be Internet History — This is the sort of thing that you’d see on Usenet groups or get in your email when the internet was brand new. For your convenience we will publish below but to get the full effect visit the Tripod built web page which if you notice hasn’t been updated since 1997.